The spiritual embers from several previous civilizations still burn at Clarks Gully at the southern tip of Canandaigua Lake (Finger Lakes, NY). Clarks Gully lies at the base of South Hill, or Nundawao, where the Seneca people were born. It has numerous fields of consciousness and is a precious piece of Mother Earth's soul. It is a great place to pray at. Wow what a day. It was getting late in the day and I turned my focus to finding the Intricate Stone Mound we found July 4th weekend and other nearby stone mounds. I also needed to spend some time meditating and spiritually cleaning up this sacred place. Stone Mound. Notice how the stones to the left of the cushion appear to make a seat of sorts. Same Stone Mound viewed from a distance. The Intricate Stone Mound I was looking for. Pepper in the dimpled center of the Intricate Stone Mound. A better view of Pepper in the dimpled center of the Intricate Stone Mound. The rod gives perspective to the depth, or what remains of the depth of the dimpled center. A wonderful day. And in true fashion I made a made attempt to hike a loop on the trail to get back to my car. Thankfully I cut my losses and backtracked and walked along Brink Hill Road to get to my car. What blessing to be shown such ancient architecture and attempts to work with Mother Earth. As I progressed in, the Land of Plenty for marked Spirit Lines, my interest in them began to diminish because they were all over the places. Then I found an interesting Manitou, or upright stone. What was unusual about this upright stone was that it not only marked the Intersection of several Spirit Lines (Ley lines) but that the Spirit Lines coming into the Manitou Stone where marked with stones; creating a circle of stones, or spokes around the centerpiece Manitou Stone. The Pictures below show this formation from a variety of viewpoints. Looking toward the Upright Stone. Notice moss covered stone and rod marking the Spirit Line. Looking away from the Manitou Stone. Nice Green orbs. Many of my pictures of this charged area had orbs in them. The Spokes. Notice the stone to the left of Pepper (white dog) marking a Spirit Line. The stone Jaeda is sitting on marks another Spoke, or Spirit Line. The rod is on another Spoke, and there is a stone in front of it on the upper center. My backpacks on another Spoke, I don't remember if it is on a stone. Sad to see a sacred place desecrated with the intention of violence (hunting. stalking, killing) and debris (shotgun shell.) Remember Native Americans would pray and give thanks after taking an animal to balance the act of violence. I picked up the shell and said a little prayer to counteract the negativity. What is interesting about these two boulders is that they also act as a hub, or the intersection of, several Spirit Lines. The closest rock marks the intersection of 4 Spirit Lines; the one in the distance marks the intersection of 3 Spirit Lines. As a Geomancer I wonder how they were so accurately able to find these power points? Did they have dowsing tools? Could they feel them? As I progressed I continued to find more Spirit Lines marked by stones. What I found next was incredibly informative--a stone mound covering Earth Chakras with a series of Ley Lines marked by stones next to it. It told me--- that it was highly likely that the same people that marked the Spirit Lines with stones also covered the Earth Chakras with stone mounds. I do not think this is a stretch, especially once you see how close the marked Spirit Lines are to the stone mound. or was it coincidence? Jaeda (black dog) is on the stone mound. Pepper (white dog) is on one Spirit Line marked by large stone on the left and my back pack on another stone. The rod shows the mound to be almost 3 feet high. Two Spirit Lines marked by stone--in the picture the measuring rod and branch outline the direction of the Spirit Lines. The stone mound is on the upper left. Measuring Rod marks the series of 3 Earth Chakras on the same energy line. Notice that the rod is in the exact middle of the mound. Although the picture does not adequately show it, there is a overflow (seasonal stream after rain) that skirts the mound and has created a ditch on the back side. Notice how the rod is sunken and the cushion is as well. We must go back at some point and re-direct the water to preserve the mound otherwise over time the water will cause the mound to begin to deteriorate. Again the ditch that threatens the mound. The mound is on a slight incline, notice how much higher the other side is. REPAIR required to redirect water. Very interesting how marked Ley Lines and stone mounds are together. One of the more interesting designs was stones marking of multiple Ley Lines and a sacred circle, with a vortex. The circle was connected to one Ley Line. In the picture above the stone on the bottom right is on a Ley Line marked by the red and white marking rod. The Ley Line runs into the sacred circle marked by the orange backpack in the distance. Both Pepper (white dog) and Jaeda (Black dog) are on stones marking Ley Lines that cross (break off like a V) from the main Ley Line marked by the rod going toward the sacred circle. The dogs are in the sacred circle. It is chakra, or vortex, of any energy I am not familiar with. The circle is incomplete; you can see a few of the stones, others are covered with leaves. Looking away from the sacred stone circle. The Dogs remain in the sacred stone circle in the picture above. Notice the red and white marking rod resting on a large stone. It marks another Ley Line crossing and breaking away from the main Ley Line going towards the sacred circle. Notice also the orange backpack to the right of the large stone. The large stone marks another Ley Line that crosses and breaks away from the main Ley Line. In other words a Ley line runs from the stone underneath the orange seat cushion and the orange backpack. More Ley Lines marked by stones and Orbs. In the picture above several stones mark a series of Ley Lines. Notice the many orbs in the top center and left of the picture. The stone in the center bottom marks the intersection of 3 Ley lines. Beginning from the left. 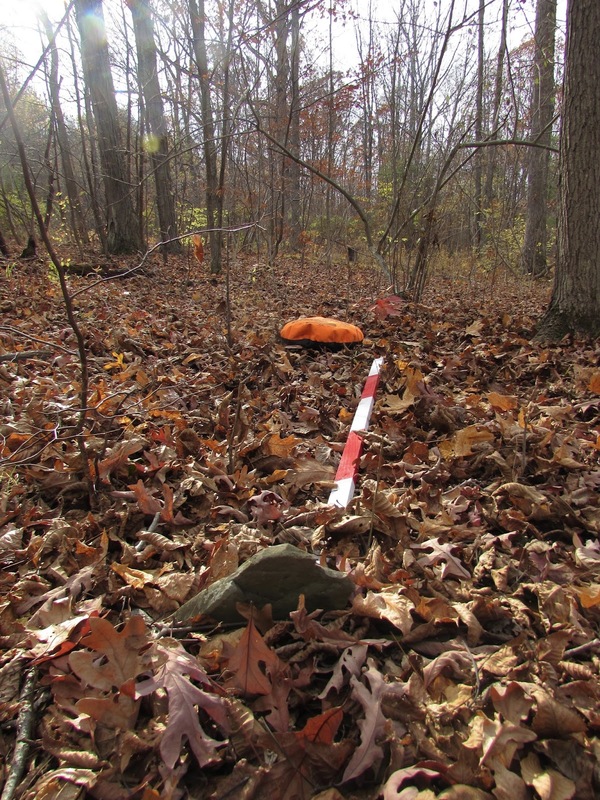 One Ley Line is marked by the branch between the orange seat cushion next to a smaller Upright stone. The branch between the two marks it. The stone next to Pepper (white dog) is on another Ley Line. The branches on either side of the center stone marks it. Jade (Black dog) is on another stone on a Ley Line connected on the main Ley Line. Notice the backpack next to a large stone in the background. It is on the Ley Line. Another view of the network of Ley Lines marked by stones. The branches better show the 2 Ley Lines connected to the main Ley Line. Another set of Ley Lines with stones marking them, highlighted by branches. Another view notice the orb on the upper left. I decided to take advantage of the warm weather on election day and survey the Brink Hill area. Specifically I wanted to find the three-tiered mound Stone Pile Whisperer had shown me five years earlier. Also I to see if there were otherr stone mounds in addition to the ones we discovered there this summer. I found a few other larger stones mounds. But I found something else, something I had not been looking for; stones marking Ley Lines, or what I call Spirit Lines. Dozens, if not hundreds of them, or more. WOW. I felt as though I was being directed to them. After all, my intention was too looking for stone mounds covering energy formations. I found so many Spirit Lines marked with stones that I gave up photographing and cataloging them. I will begin posting pictures of a few of them in separate posts. In the picture above both of the large stones are aligned on a Ley Line. The red white rod is in 1' increments to show the size of the larger stones.